Last week we had a trip to Valparai near Pollachi,Tamil nadu for summer vacation in our car. We packed few rice varieties for lunch and had it during our road trip in Attakatti. 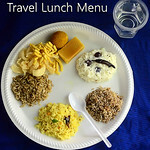 Usually we make Tamarind rice/Puli sadam and Curd rice for travel. But this time, Sendhil told us to prepare some other rice varieties for a change. 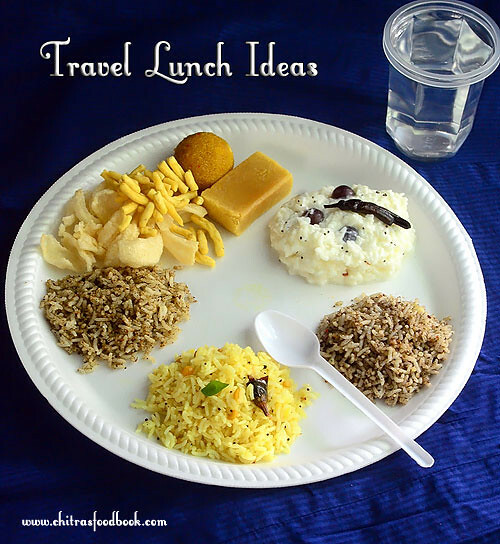 So my MIL made this yummy, easy, comforting and a healthy South Indian meal for our travel.I thought of sharing this easy travel food recipes idea with you all. It would be helpful for you to plan and prepare food for your short trip/Picnic during this Summer holidays. 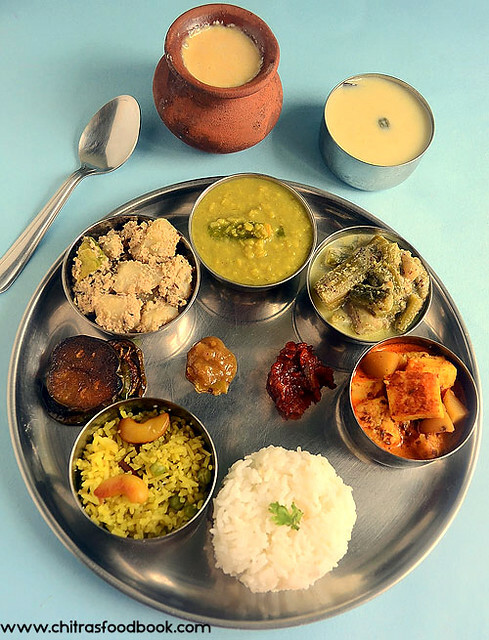 My MIL made Milagu jeeraga sadam/ Pepper cumin rice, Ellu sadam/ Sesame seeds rice, Lemon rice and Curd rice along with vadam/Vathal. We also carried some store bought sweets and snacks to munch during our travel . 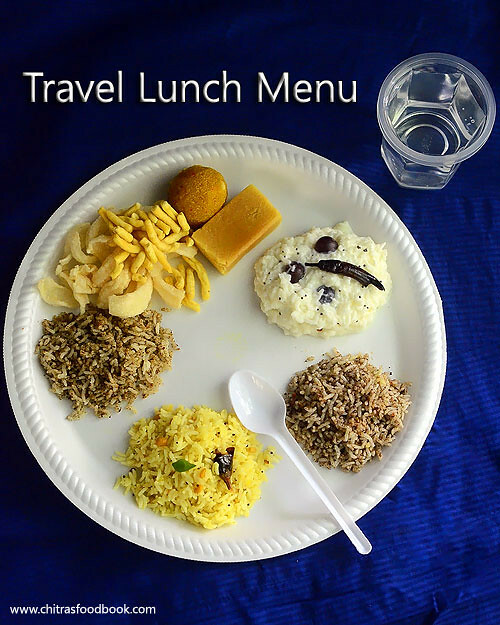 Lets see how we prepared this simple and yummy travel lunch menu. 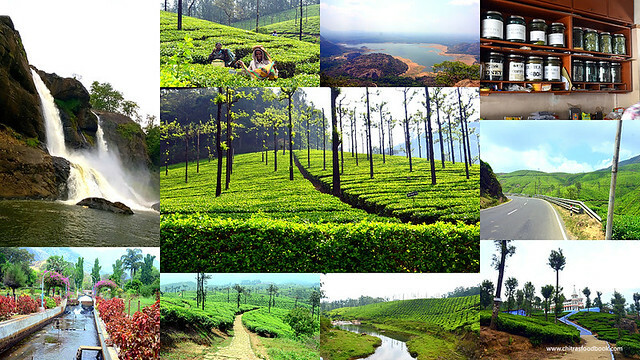 Here is a collage of Valparai-Athirapally Pictures. Check THIS LINK for more pictures. On the previous day night of travel, prepare the lemon rice paste.Make sesame seeds powder by dry roasting the sesame seeds, red chilli and then powder it adding salt.Make pepper cumin seeds powder. Refrigerate the lemon rice paste alone. Keep the powders in an air tight box and store it. The next day morning as soon as u get up, wash and soak the rice in required water for 20 minutes. Use two cookers. One for curd rice and other one for rice varieties. Soak the rice separately in 2 cookers. Rice will be well soaked by the time u take bath. Pressure cook the rice for one whistle in low flame and switch off the flame. Remove the lid after the steam is released. NEVER USE YOUR HANDS FOR MIXING THE RICE. USE LADLE FOR HANDLING THE RICE. Spread the rice in a plate and add some gingely oil. Take the rice in curd rice cooker and mash it well adding salt and milk. Do not curd when the rice is hot. Add curd after the rice becomes lukewarm. 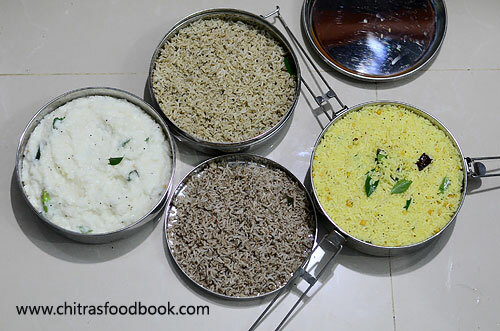 Add the seasoning ingredients for curd rice. Mix well. Add curd and mix well.Check for taste. Do not make the curd rice too thick or too watery. Make it like a creamy consistency so that it won’t become too hard in the afternoon.Check for taste and add more salt if needed. By the time, u mix the curd rice, the rice spread in the plate would have become warm. Divide the rice into 2 portions. Take one portion of the rice and make lemon rice adding the lemon rice paste.Add gingely oil generously. Check for taste and add more salt & paste if needed. Take the other portion of rice and divide into 2. 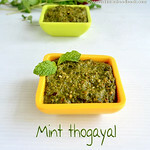 Use one portion for making ellu sadam and the other one for milagu jeeraga sadam. Add gingely oil for ellu sadam and ghee for milagu jeeraga sadam generously.Do not forget. NEVER USE YOUR HANDS FOR MIXING THE RICE. USE LADLE. Prepare all the rice varieties and stack in the boxes. Make Neer mor/Spiced buttermilk (Thalicha more) and store in a bottle. Deep fry Koozh Vadam/Vathal or papad and mormilagai.Store the vadam in a polythene bag or ziplock covers after it cools down. Pack some pickle in a small container. Arrange everything for travel in a bag. Take the sweets, snacks and fruits if any for travel. I have shared some general point to remember while preparing food for travel. Never put your hands to mix the rice varieties, use a spoon or ladle instead. If you mix the rice with your hands, it won’t stay good for more than 2 hours in summer. 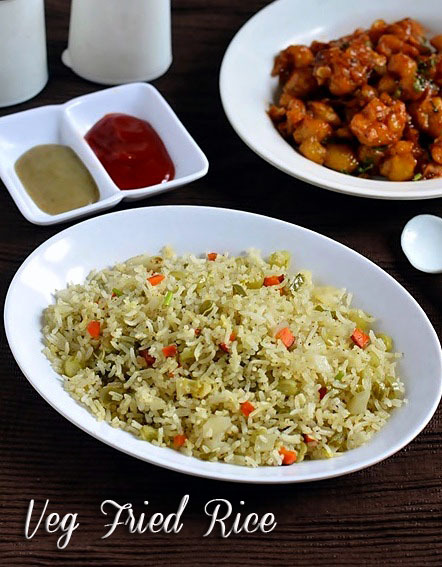 Add gingely oil generously while mixing the rice. It helps to prevent the rice from drying. Make sure you don’t use raw coconut in the dishes. If you use coconut, roast it well or saute the coconut based dish in oil till all the moisture content is completely gone. 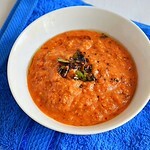 If you are making curd rice, add less curd and more milk while mixing. It helps the curd rice to set well while eating.Never add curd in hot rice. 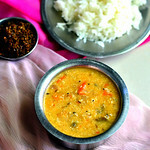 Carry a bottle of spiced buttermilk or diluted curd to add in the rice while eating. 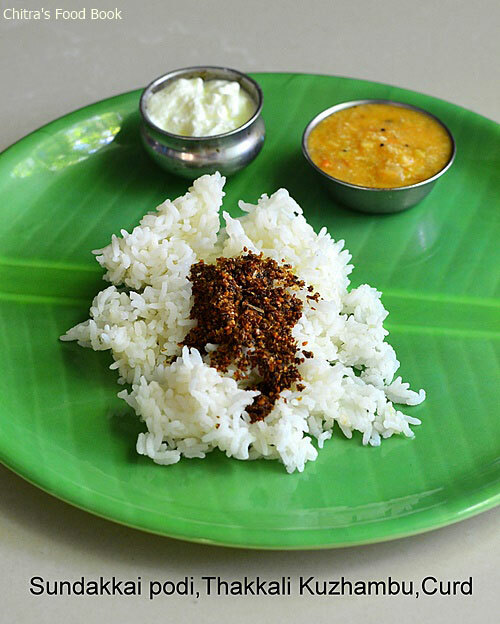 Suppose if the curd rice becomes too thick, you can add buttermilk and bring it to proper consistency.In the buttermilk bottle, put some slitted green chillies, ginger and few curry leaves with mustard seeds seasoning ( make thaalicha neer mor). It helps to keep the buttermilk fresh and tastes less tangy. We packed the rice in our steel travelling set. If you don’t have a travelling set, you can pack them in use & throw silver foil packs or plastic boxes. 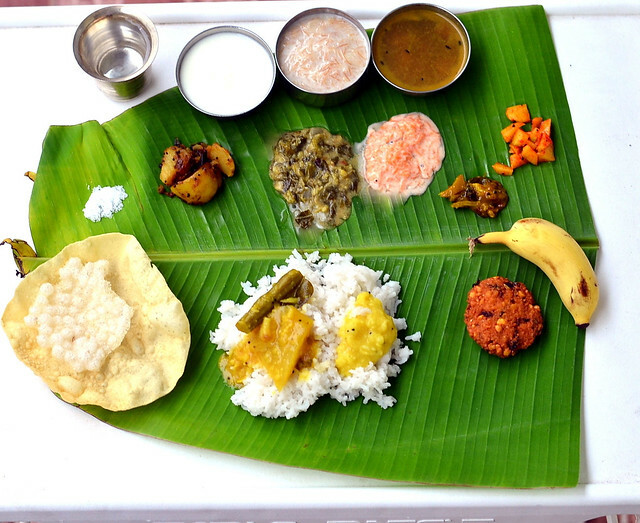 It is better to use banana leaf for packing the food. It gives a nice flavor and a healthy choice as well. 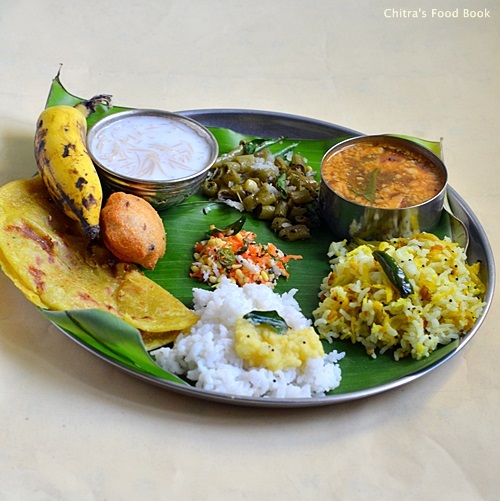 Is it not a happy and comforting meal for your travel ?? Prepare & Enjoy it !! 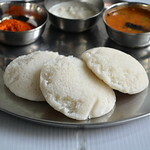 Its been a year since i shared a North Indian lunch menu here. After i had tried & posted my Punjabi & Gujarati Lunch Thali,i was looking forward to try Rajasthani and Bengali Lunch platters.Based on the suggestions i received from Facebook’s Chef at large group( one of my favorite groups in fb )foodies,i tried this menu list for a Sunday lunch.Thanks everyone for flooding your ideas .Being a vegetarian,i tried some typical, authentic recipes to make an yummy lunch menu.I prepared Bengali Chaler payesh, Mishti Doi, Mishti pulao, Begun bhaja, Kalai er dal, aloo posto, Doodh Shukto, Bengali tomato Khejur chutney and pickle.I have shared the links for all these recipe below. I am yet to post mishti doi, Doodh shukto and tomato chutney recipes.But i have given the link for the source of these recipes.I thoroughly enjoyed cooking and tasting all these dishes.When i cooked all these recipes,i found Bengali Gobhido bhog rice, Panch phoron – 5 spice mix plays a major role in their cooking.Cooking procedures were very simple yet delicious.It took nearly 1.5 hours to make this entire plattter.Sendhil & Myself enjoyed this thali very much. I loved chaler Payesh ,Begun bhaja the most whereas Sendhil’s choice was Chanar dalna and tomato chutney .Over all i am very happy that i tried & tasted this authentic Bengali Vegetarian Lunch Menu.Lets check out the menu list with some pictures below. RIP DR.APJ Abdul Kalam Sir . Actually I had to share a biryani recipe in my Sunday lunch series today.Sorry for disappointing you all with this post.Last 3 days I was in Rameswaram for temple visit.We had good darshan but unfortunately we all got stomach problems due to some food allergy.By God’ grace,our trip was successful and reached Bangalore yesterday.As our stomach is completely upset,we wanted to avoid spicy foods for some days.So this afternoon I made Sundakkai Vathal podi(Dried Turkey berry powder) & Spice less,no tamarind thakkali poricha kuzhambu(tomato gravy without tamarind) along with Paruppu sadam(moong dal tadka) & thayir sadam for our lunch.I guess most of you just make dal & rasam during sick days but this is our standard lunch menu whenever we recover from any health ailments.Sundakkai/Turkey berry is a good antibiotic to kill the ameoba in stomach.Pepper & cumin seeds used in this powder helps to improve appetite and aids digestion.Tomato is an energy booster basically.Coconut,cumin seeds/jeera and onions acts as a coolant for the upset stomach and helps for digestion.Moong dal and curd/buttermilk helps to cure stomach inflammations.To sum up,this South Indian Lunch menu would be soothing and tasty for an upset stomach & bitter tasting tongue.Do try this menu for a change.U may like it.Not just sick days,u can consume Sundakkai podi at least once in a week to keep your stomach clean if you eat hotel food regularly.Lets check out the recipes of sundakkai podi and thakkali poricha kuzhambu below.Last but not the least,I will surely share my biryani post sometime in this week . 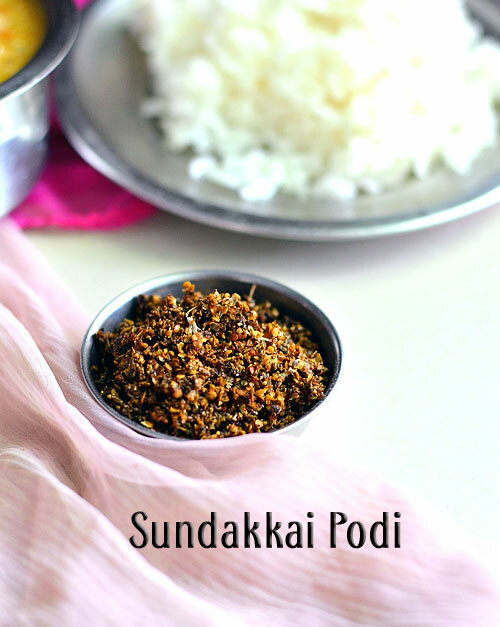 Sundakkai podi : Heat oil in a kadai & saute the turkey berries/sundakkai.Add cumin seeds,pepper corns and roast everything well till you get a nice smell of roasted turkey berries. Powder everything together adding salt & finely chopped garlic.Mix with plain rice adding ghee. 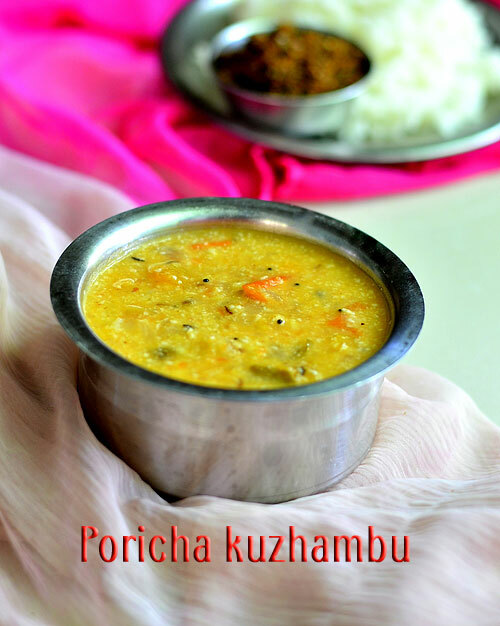 Thakkali poricha kuzhambu :Heat oil in a pressure cooker base.Splutter mustard seeds,urad dal,chana dal,cumin seeds.Saute onions,curry leaves,green chillies and tomato till it turns mushy. Add water,moong dal,turmeric powder,salt and pressure cook for 2 whistles in low flame.In the mean time,grind the coconut+jeera to a smooth paste adding little water.After the steam is released from the cooker,add this paste and boil well.Gravy will thicken.So add water and salt accordingly.Serve with plain rice adding few drops of ghee. For paruppu,pressure cook dal adding a pinch of hing,turmeric powder and mash it.Do the seasoning at the end and serve with rice & ghee. 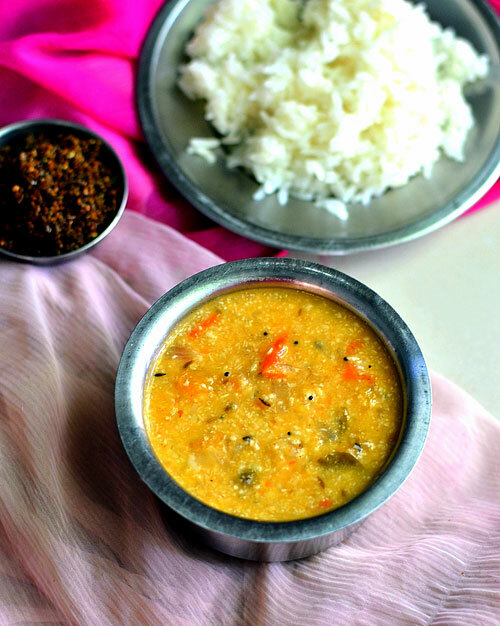 Start your lunch with paruppu sadam continue with podi,poricha kuzhambu and finish with curd rice or drink buttermilk.Enjoy this healthy and spice less lunch menu. 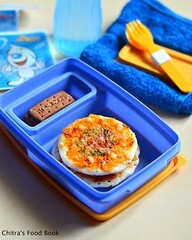 Try this simple lunch menu during sick days.U can recover quickly ! 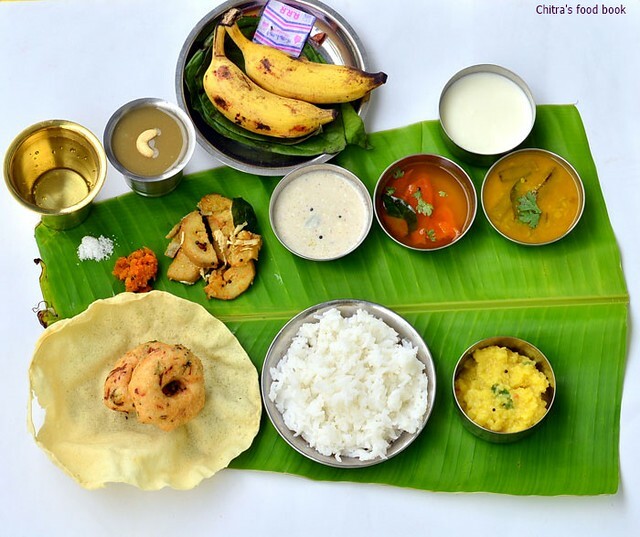 I have been thinking to share our amavasai vazha ilai saapadu for years.But somehow I couldn’t do it.Yesterday I made this South Indian style No onion No garlic thali for No moon day/Amavasya.Every month on No moon day my FIL used to do “Tharpanam” by keeping all these dishes in banana leaf.So we make Vadai and payasam along with Rice,Sambar,Kootu or curry,Pachadi,Paruppu,Rasam,Appalam and Pickle.Vada and Payasam/Kheer are optional.Some people make it every month.Vaikasi and Aadi amavasai are very special to us for which Vadai and payasam are compulsory.Yesterday I prepared all these dishes especially for this post.I love cooking this Amavasai lunch menu as it is very easy to prepare with less chopping and grinding works. It takes just 45 minutes to make this platter if you don’t prepare Payasam and vada.I have shared the method of preparation and recipes with links.Please click them to view the particular recipe.I have also shared more ideas for cooking a no onion no garlic lunch menu.Hope this post would help the South Indian beginners who want to cook a No onion No garlic food for their lunch.Please check out my Tamil nadu lunch menu ideas – 1 , Lunch menu ideas – 2 and a complete South Indian thali for guest with a detailed serving procedure if interested ! As I told in my South Indian full meals post,I will share a North Indian Thali very soon.Stay tuned !! 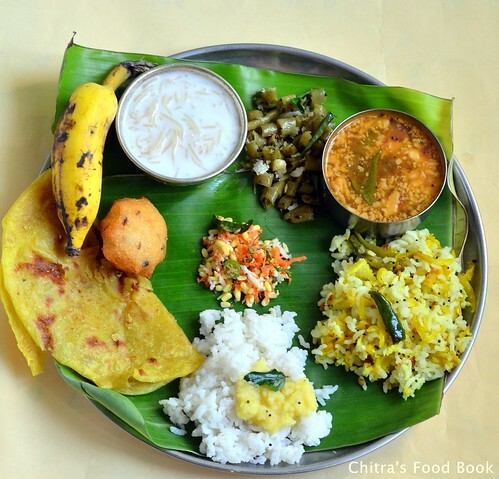 Friends,this week i have shared a lunch menu instead of Sunday biryani recipe.Sorry for disappointing u all.Yesterday i made this simple yet delicious lunch menu for Ugadi celebration.So i thought of sharing that platter here.Its been my long time wish to post a Karnataka style lunch menu in my blog.So I took Ugadi festival as an opportunity and made a simple lunch menu.After i prepared Holige successfully,i asked my friends to suggest me an easy lunch menu idea for Ugadi festival.Based on their suggestions,i made Obbattu,Obbattu saaru,Mavinakayi chitranna,Mysore Bonda,Beans palya,Shavige payasa,dal,plain rice and the most popular Kosambari recipe.Also Megha suggested me a very easy recipe for Obbattu saaru.As i had made Obbattu in the previous day,making this menu was easy for me.In this post,i have shared the recipes of Kosambari( using moong dal ) and beans palya.I have made a separate post for Obbattu saaru and Mavinakayi chitranna .Now lets see this yummy Karnataka lunch menu recipes for Ugadi festival. 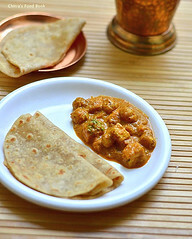 I assumed that u have made obbattu/Holige the previous day and shared the procedure of making other dishes below. 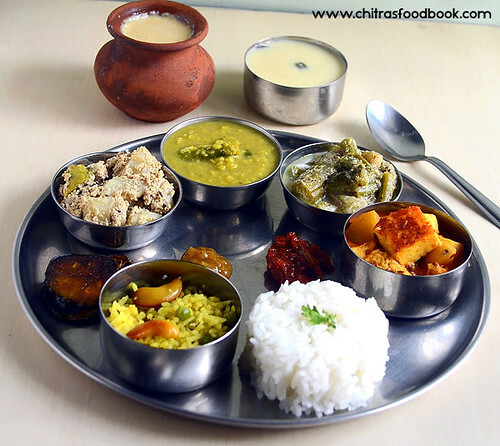 To make this menu,pressure cook one cup of rice along with moong dal in a small closed container.Soak tamarind in water for 20 minutes.Wash and soak urad dal for mysore bonda for 45 minutes in enough water. Pressure cooking rice and dal will be done in 15 minutes. In another burner,boil the vermicelli and let it cook.In the mean time,wash and peel the skin of raw mango.Grate it and finely chop the green chillies.Heat a pan and do the tempering,add green chillies and grated mango.Saute well adding salt and turmeric powder.Mix well till mangoes get cooked.Lastly add the grated coconut,saute for a minute and switch off the flame.After the pressure is released,spread the rice in a plate and let it cool.Add this maavinakayi paste and mix well adding sesame oil.Adjust salt and garnish with coriander leaves. 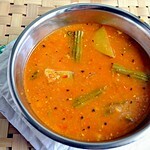 Please refer my mavinakayi chitranna recipe post for another method. Now vermicelli will be cooked well,add milk,sugar and roasted nuts and remove from the flame.Set aside. To make kosambari,first wash the moong dal,drain the water and soak it for 30 minutes in enough water.After 30 minutes,drain all the water completely and add grated coconut,grated carrot,finely chopped cucumber,green chillies and coriander leaves.Mix well.Add salt just before serving otherwise this mixture will leave more water while serving.So add salt only before serving.Lastly do the tempering and Kosambari is ready. For beans palya,wash and chop the beans into small circles.Heat oil in a kadai and temper mustard seeds,urad dal and curry leaves.Add finely chopped green chillies and beans.Add the required salt and saute well for few minutes.Sprinkle some water and cover cook the beans till its done.Mix it once or twice in the middle.Add the grated coconut in the end,give a stir and switch off the flame.Beans palya is ready. Lastly u can do the obbattu saaru by using the reserved holige pooran dal water.Please check the link for obbattu saaru recipe above.By now,urad dal would have been soaked well.Grind the batter and make bonda.Serve saaru and bonda really hot to enjoy its best taste.So I made it at the end. You can finish the entire process within an hour if u plan it right.Serve everything hot and enjoy ! 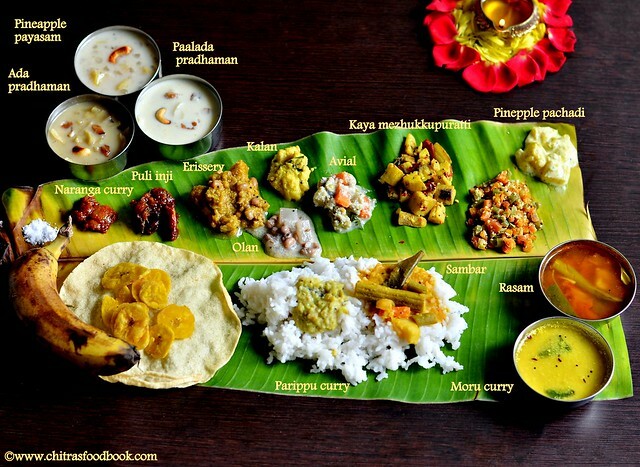 Try this easy yet yummy lunch menu and enjoy Habbada Oota on this auspicious day ! Very good recipes Tags: Also Megha suggested me a very easy recipe for Obbattu saaru( I will share that recipe in the coming week). 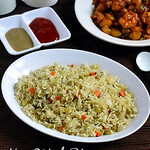 I am glad i have successfully reached the 3rd post in my Sunday lunch Recipes Series .I have been sharing biryani,pulao & other rice varieties that i make in weekends.This week,i have blogged my vegetable fried rice recipe in Indian style using electric rice cooker.I know most of u make veg biryani & veg pulao in rice cooker.But making a fried rice in rice cooker may be new to some of u.Not just this,the method i have shared here may also be new & it is somehow different from our usual fried rice recipe.A very big thanks to my dear friend Shalini for teaching me this easy,hassle free,wonderful ,Indian style fried rice recipe.Whenever i go out for shopping in weekends with my family,i make this rice recipe along with curd rice.It stays warm & as soon as we reach home,i just saute the required amount in ghee & serve it hot hot.As we love to have fried rice with tomato sauce as side dish,i don’t make any specifically.But my friend suggested peas butter masala & paneer butter masala as the best side dish for fried rice.So make it as per your choice.Ok,Lets see how to make fried rice recipe in electric rice cooker. 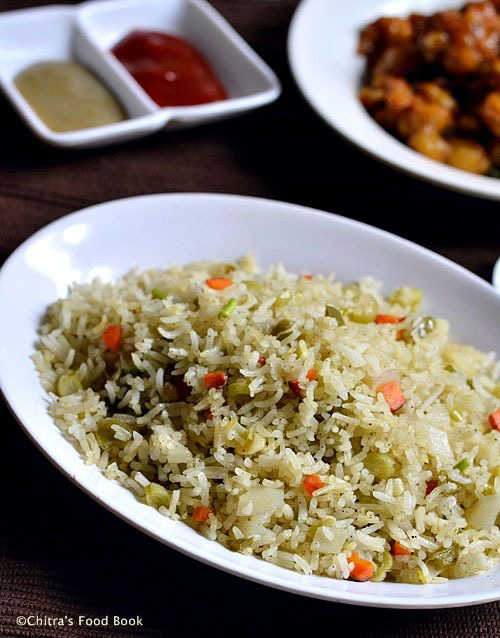 Wash the rice twice & drain the water.Soak it adding 2.25 cups of water,lemon juice & oil for 1 hour.Rice will be soaked well.In the mean time,finely chop the vegetables,onion,capsicum & spring onion.Keep it ready. Switch on the rice cooker,keep in cooking mode & allow it to heat for sometime. 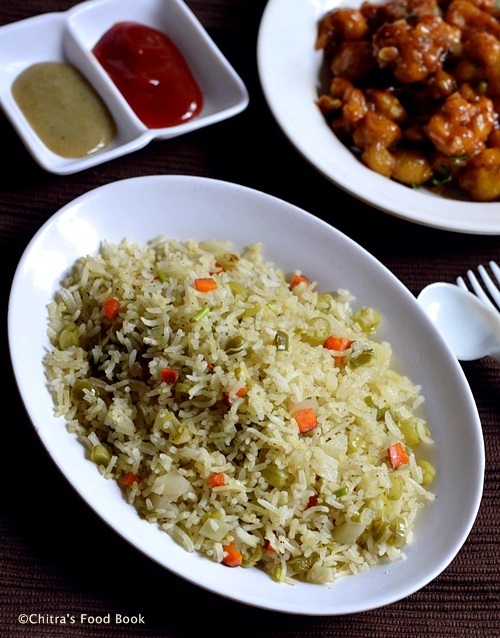 As soon as the plate is heated,add the soaked rice along with water,finely chopped carrot,beans & potato.Add the required salt,mix well & cover the rice cooker.Let the rice cook well.Open it once in the middle & fluff it with a fork.Once its cooked,rice cooker will switch to Keep Warm mode automatically. Finely chop the cabbage,onions,garlic cloves,bottom part of spring onion & capsicum. Heat oil in a kadai & saute them well adding little salt( remember we have added salt in rice) Add this to the cooked rice.Add pepper powder & keep it closed till use.Now the rice cooker will be in”Keep warm” mode. Just before serving,heat ghee in a kadai and add the required amount of fried rice.Saute well in high flame for a minute,Keep tossing & serve hot immediately.Enjoy with any side dish or tomato sauce. I have not used soya sauce here.You can use it if u need. Adding onions & garlic is purely optional.My friend doesn’t add it. Adding lemon juice in rice helps to give u white colored rice after cooking.But do not add more. I don’t add ajinomotto as it is not good for health. WISH U ALL A VERY HAPPY ONAM CELEBRATION ! Onam festival is the most anticipated day for me to express my passion for Kerala food.Basically Sendhil loves coconut based recipes a lot & i am a big fan of Kerala style dishes.Not just the food, i love kerala sarees and their traditional ornaments too .So every year during Onam, i never fail to make sadhya feast at home to treat Sendhil and myself with varieties of Kerala delicacies.For the past two years, i have been posting the same here.And this year too, i was eagerly waiting to post this sadya menu. Every year i love to attempt some new sadya special items for the menu and i prepared Ada pradhaman & Palada Pradhaman recipes using homemade Ada. Pineapple payasam and Pineapple pachadi as suggested by my neighbour Mrs.Prema.Mathanga erissery and kaya mezhukkupuratti out of my own wish.I referred many of our Kerala bloggers websites and i have given the links as well.Thanks to one & all for sharing these wonderful recipes with us.For other sadya recipes like Kerala sambar, Rasam,Thoran,Puli inji,Parippu curry and avial,i referred my previous sadya recipes.All the recipes came out very well and we enjoyed this Onam feast well in advance .Here you go, my Onam sadya recipes 2014 for you all.Hope i have followed the correct serving order .I Wish all my readers and friends a very happy Onam.”ONAM ASHAMSAKAL” !! I couldn’t take stepwise pictures for this sadya but i have shared some pictures of how i made this sadya quickly.Last year when i made sadya,i noticed that most of my time was spent in pre preparatory works like grating coconut,extracting coconut milk,grinding masalas,chopping vegetables and for cooking dals & vegetables.This year i wanted to make all these works simple and easy.So instead of grating 2 coconuts,i made small slices of it using a ladle edge with thick & blunt handle as u see in the picture.I did not use knife as i am afraid of using it.Use knife only if you are confident of handling it and make sure your mixie blades are in good condition else it may break.Then I dry ground all the coconut slices together and divided them into 2 parts.I used one part for taking coconut milk and the other part for masala.It saved lot of time for me. 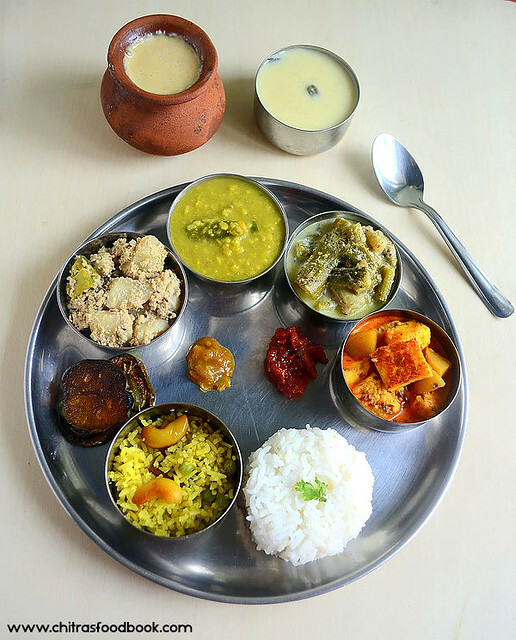 Also i pressure cooked dals for parippu curry and sambar together in my big pressure cooker by placing moong dal in the bottom of cooker and toor dal for sambar in a tiffin box.Please refer the picture.U can even keep a plate of mixed vegetables required for sambar over the toor dal. For cooking Vanpayar and vegetables for olan,kalan and erissery, i again used my big cooker and cooked them together by keeping one above the other in small bowls and plates.As all these veggies gets cooked in one go,u just have to add them in coconut mixture and boil it.For thoran, i cooked it in my small cooker by keeping in high flame for two whistles. For pradhaman,i prepared homemade ada.So i made it in the previous night and stored in refrigerator.Also i cleaned & chopped pineapple pieces and kept in a zip lock cover and refrigerated it.When u have ada & pineapple cubes ready in hand,u can make these payasam recipes very quickly. 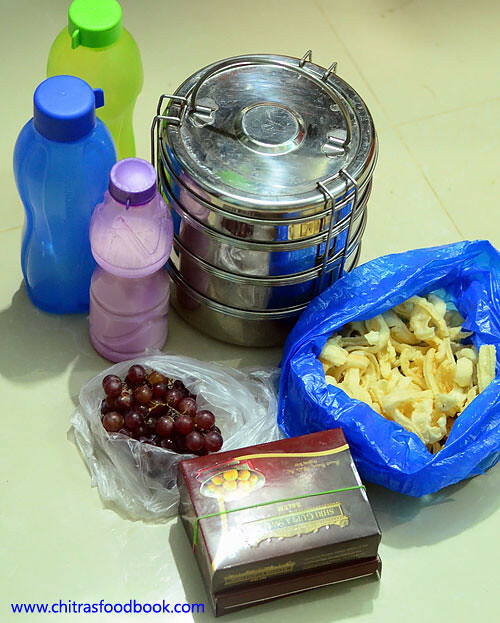 All these pre preparatory jobs got over in 30 minutes & cooking took nearly one hour.This entire sadya took 1.5 hours totally.Do follow these techniques and make your sadya feast quickly & easily.Do share your methods of quick cooking in the comment section so that others get benefitted . 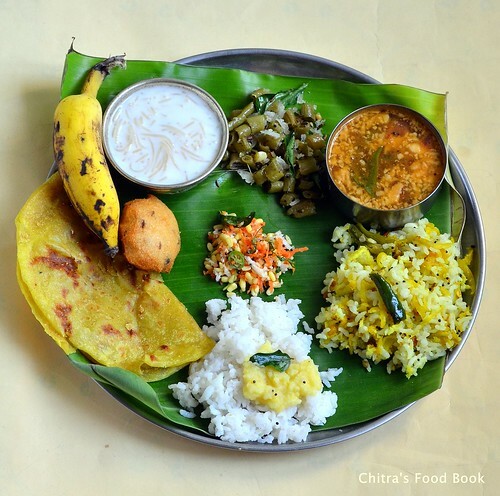 Disclaimer: I know these are not the authentic method of cooking Kerala food but to make my job easier, i followed these steps and i hope it would help beginners.Friends,please excuse me . 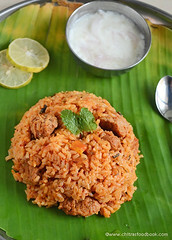 Sadya recipes for Onam festival ! 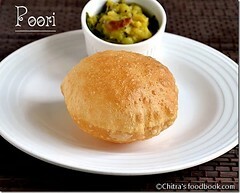 Click on the recipes to see the blogs from which i tried these recipes.Thank u friends.Everything came out very well. 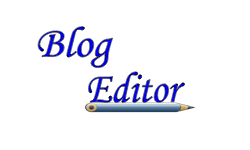 I have made separate posts for some of the above mentioned recipes with stepwise pictures. 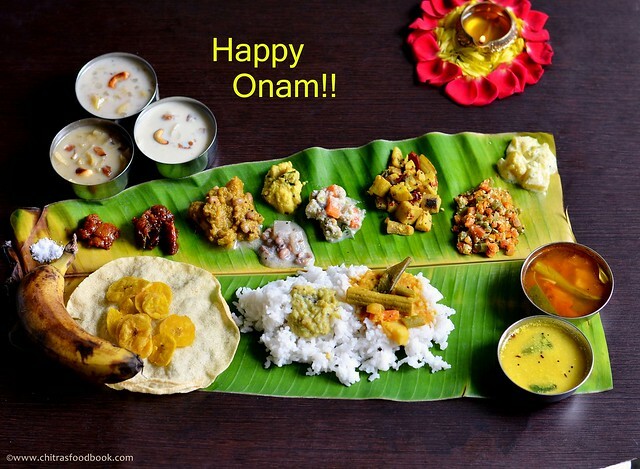 Please click on the link for the recipe.Thanks for visiting this page.Hope u will try all these recipes and like it.Once again,I wish u all a very happy Onam.Enjoy the feast! 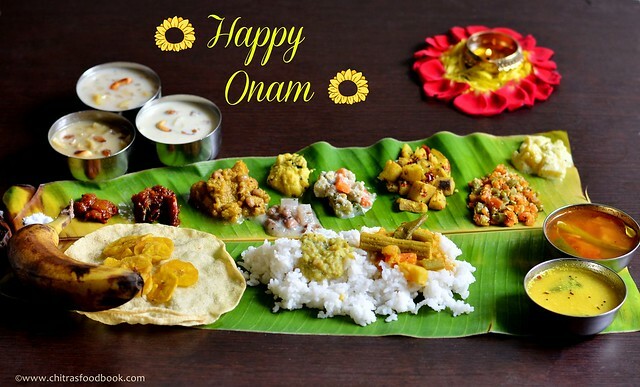 WISH U ALL A VERY HAPPY ONAM CELEBRATION ! !